Justin Bieber‘s mom is making sure Hailey Baldwin feels like part of the family. Justin Bieber‘s mother more than approves of new daughter in-law Hailey Baldwin. 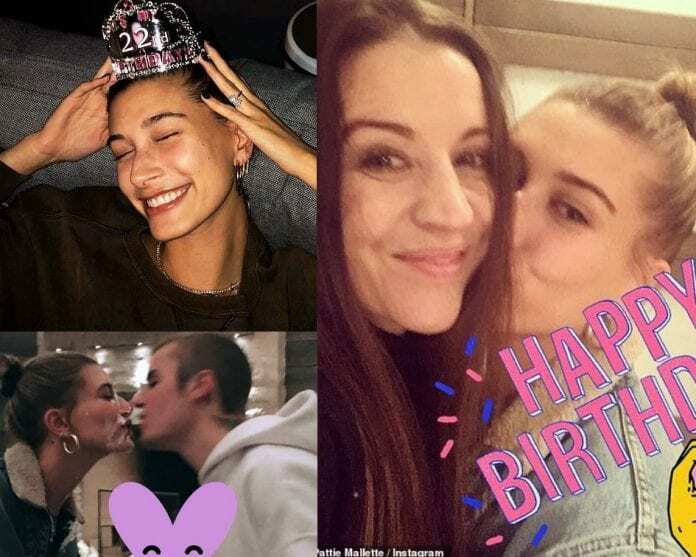 Pattie Mallette, 43, wished her son’s new wife a happy 22nd birthday in an sweet message and photos on Thursday. “HAPPY BIRTHDAY @haileybaldwin !! I LOVE YOU!! I’m SO #THANKFUL to have you as a daughter!! !” Mallette shared on Twitter. A video posted on Pattie’s Instagram Stories shows Justin, 24, holding a large cake topped with strawberries, cream and thick icing while giving a speech, although it’s not known what he said as Pattie played the song, I Like Me Better by Lauv, over the clip. Justin’s mom also got to spend some quality time with Hailey on her birthday, and she shared some of the festive and loving moments on her Insta-Story. In one adorable picture, the new Mrs. Justin Bieber can be seen giving her new mother-in-law a kiss on the cheek. There’s also a cute video where the pop star is casually talking to his new bride and then he joking pushes a cake he was holding his hand into her face. A follow-up photo showed the happy couple going in for a kiss with cake and icing all over Hailey’s face. The birthday wishes come about a week after the model changed her Instagram handle to @HaileyBieber, as well as in her bio to read, Hailey Rhode Bieber. It also came about two months after Justin and Hailey tied-the-knot in a secret ceremony at a New York courthouse in September. News of the nuptials set off a media frenzy with fans, critics and casual pop culture trolls. Adding more fuel to the marriage rumors at the time, the pop star’s mom wrote, ‘Haters gonna hate. #Love Wins’ the very next day. The name change comes after Hailey was spotted at Levi’s new Time Square Flagship store opening in N.Y.C. on Thursday evening, rocking the brand’s iconic trucker jacket with her new married last name splashed across the back. The Love Yourself singer recently confirmed their marital status when he captioned: ‘My wife is awesome,’ in a photo of the couple smiling and holding hands. The 24-year old star proposed to Hailey with a custom oval engagement ring on July 7 while the couple were in the Bahamas, according to People. Next articleChris Pratt & Girlfriend Katherine Schwarzenegger Is Ready To Get Engaged After Thanksgiving Holiday Together?